Billions of taxpayer dollars are spent every year to stimulate economic development. Is it going where we think it’s going? 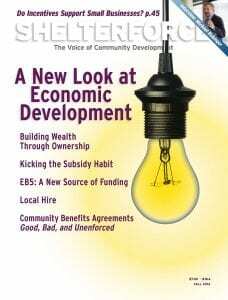 Two years ago we put out a special focus issue on “work.” In that issue we looked at cooperative development and nonprofit-owned social enterprises, at local hire provisions for community development projects, and at organizing efforts to pressure a private developer to provide training and jobs. Since then we’ve written about how Austin, Texas, makes companies achieve results before getting their promised incentive payments, about community development financial institutions rethinking the kind of jobs they generate, and about existing businesses converting to cooperatives. In this issue, we continue this theme with a collection of articles on equitable economic development, with an increased focus on the role of the public sector. After all, billions of taxpayer dollars are spent every year to stimulate economic development. Is it going where we think it’s going? (Here’s one example of how it often isn’t.) Can we find ways to make use of formerly obscure federal sources of funding? Are big economic development investments generating the results we want, and how do we measure that? The answers are not always easy. In Baltimore, a massive city-within-a-city subsidized corporate development has both supporters and detractors within the community development field. In fact, whether we should use economic development incentives at all is in dispute. Should we be using that money differently? Could cities give preference to businesses that have demonstrated a commitment to the community, like B Corps? Given these challenges, in the final article of our New Frontiers in Community Development series, supported by Citi Community Development, we turn to the positive and explore what municipalities can do to step up and encourage new economic models and community ownership. We also come back to community benefits agreements and local hire provisions, which often involve the public sector along with developers, community advocates, and organizers. Community benefits agreements—getting promises from developers who are benefiting from public funds (and possibly causing displacement or other harm) to produce various benefits for a community, from living-wage jobs to housing to parks to training—are often a great organizing rallying point and a way to move beyond a yes-or-no fight on some big projects. However, enforcing them is a recurring problem, as it takes having a carefully worded contract and constant monitoring. We explore this challenge and what advocates say needs to be done to make sure these agreements deliver. Local hire, meanwhile, has been evolving. It is a frequent goal of community benefits agreements and a stipulation advocates seek for public works projects, but despite the word “local” in the phrase, advocates have come to realize that merely hiring from within a city’s borders does not by itself do enough to extend opportunity to those who have been left out. So what are described as “local hire” provisions increasingly actually include other specifications targeting, for example, those with barriers to employment, such as conviction records or lack of a high school diploma; members of groups that have historically experienced employment discrimination; or those living in economically disadvantaged zip codes. Crafting the terms of these agreements so they actually generate the desired result is important work. In our Organize! column in this issue, we get recommendations from Partnership for Working Families, which has extensive experience helping local groups craft, win, defend, and implement these kinds of provisions. And though satisfying work is itself a good thing, what makes for economic stability is not actually the job itself (too many of them don’t provide that), but the income that a job generates. What if we dealt with income directly? A perennial idea, that of “universal basic income,” is having a revival these days—and it has had some surprising supporters over the years. Just imagine if there were a floor under which your income couldn’t go. How much of a game-changer would that be? Keli A. Tianga explores the concept. Finally, we get some reflective parting words from Michael Rubinger, the longtime head of LISC, who retired in June. The man who was there from the beginning offers us his perspective on where it started, how it evolved, and what else needs doing. I concur in your theme for equity in economic development & the related discussion/openness for new approaches. My view is that “economic development” must be freed from its 25-year narrowness & limitations; this term does not mean business development & “success” is not measured in business transaction terms. Economic growth is not the objective, as this should occur naturally; subsidized growth must be meaningful in targeted areas with transparency & accountability. This is not happening. To begin with, “economic development” is a public term, whose mission is to raise standards of living & quality of life outcomes, in real terms. Unfortunately, our public actors have acted as extensions of the Chambers of Commerce, claiming great success in business metrics, yet we remain a poor city, with structural, inter-generational poverty. This year, my city of San Antonio ranked No. 4 in economic segregation; how’s that for “success” using this old “urban planning” construct? Hence, we need a new paradigm, one which measures for socioeconomic gains, in areas where needs are greatest, rather than using “metro” data which expands into 8 rural counties, encompassing 7,400 sq. mi. Our public actors effectively represent the commercial real estate industry, who coincidentally contribute (& select) their favorite political candidates, all legal of course. Who is representing middle- & lower-income families, the ones who help subsidize developers into market-ready areas, rather than in tracts which define us as a poor city? We will continue to see encroaching residential & commercial gentrification, rising taxes, fees, and “smart growth,” at the expense of our community character & long-time residents. In just 3 years, our city will declare itself to be a “world class” city, evidence of the mockery we make of loose understanding & knowledge when it comes to “economic development” malpractice. Do not forget to pick up your Visionary Awards — the planning profession will award you for your inconsequential results.